SAN FRANCISCO, California (CNN) -- Nearly a third of veterans returning from Iraq and Afghanistan who received care from Veterans Affairs between 2001 and 2005 were diagnosed with mental health or psychosocial ills, a new study concludes. The study was published in the March 12 issue of Archives of Internal Medicine and carried out by researchers at the University of California, San Francisco and the San Francisco VA Medical Center. They looked at data from 103,788 veterans; about 13 percent of them women, 54 percent under age 30, nearly a third minorities and nearly half veterans of the National Guard or Reserves. Post-traumatic stress disorder was the most common disorder, with the 13,205 veterans who got the diagnosis accounting for more than half (52 percent) of mental health diagnoses. Post-traumatic stress disorder, an anxiety disorder that can occur after the experience or witnessing of a traumatic event, can lead to depression, substance abuse, problems of memory and cognition, and other problems of physical and mental health. Others included anxiety disorder (24 percent), adjustment disorder (24 percent), depression (20 percent) and substance abuse disorder (20 percent). Of all veterans of Iraq or Afghanistan who sought VA services, post-traumatic stress disorder affected 13 percent, the study said. That's slightly less than the 15.2 percent tallied for veterans of the Vietnam War, but far above the 3.5 percent reported in the general population. Differences between genders and races were "minimal," the study said. But the youngest group studied -- veterans 18-24 years of age -- appeared to be at greatest risk. "Our results signal a need for improvements in the primary prevention of military service-related mental health disorders, particularly among our youngest service members," the authors wrote. Still, youth may have had nothing to do with it, the authors acknowledged, noting that active-duty military are typically among the youngest military. And, "because they are young, they are more likely to be of lower rank and more likely to have greater combat exposure than their older active-duty counterparts," the authors wrote. In addition, the study's conclusions may not apply generally to all veterans of the wars, since the study included only those veterans who got VA care. The authors warned, "Our results may overestimate the burden of mental health disorders because veterans with mental health disorders may be more likely to seek treatment at a VA facility than those without." The findings did not surprise former Sen. Max Cleland, a veteran who was grievously wounded during the Vietnam War and suffered depression. "This is the price of war," the Democrat from Georgia said. "You can't send young Americans to Iraq and Afghanistan ... and expect them to come home and just fit right in. They bring that trauma with them." 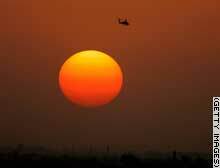 A U.S. Army Apache helicopter flies over Baghdad as the sun sets on Monday.